Smith Flow Control introduces the Easi-Drive for the water and wastewater industries. The portable drive system is adaptable and can operate many different valves, including the largest gate and butterfly valves, with a single tool. This versatility makes the Easi-Drive an alternative to installing permanent dedicated actuators for every valve. 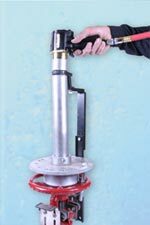 The lightweight Easi-Drive’s adaptor and reaction set provides safe operation of valves for water and wastewater personnel by transferring reaction away from the operator. Its variable torque outlet ensures that it will operate numerous valves with varying torque requirements from 350 to 75,000 foot pounds, and the operator can select torque output to avoid over-torquing the valve. The tool features continuous drive, which doesn’t damage valves like an impact wrench. The Easi-Drive is available in different power options; electric, hydraulic or pneumatic, for maximum convenience.